Back cover blurb: "I did something terrible Grace. I hope you can forgive me ..." Grace hasn't been the same since the death of her best friend Charlie. She is haunted by Charlie's words, the last time she saw her, and in a bid for answers, opens an old memory box of Charlie's. It soon becomes clear there was a lot she didn't know about her best friend. When Grace starts a campaign to find Charlie's father, Anna, a girl claiming to be Charlie's sister steps forward. For Grace, finding Anna is like finding a new family, and soon Anna has made herself very comfortable in Grace and boyfriend Dan's home. But something isn't right. Things disappear, Dan's acting strangely and Grace is sure that someone is following her. Is it all in Grace's mind? Or as she gets closer to discovering the truth about both Charlie and Anna, is Grace in terrible danger? There was nothing she could have done to save Charlie ...or was there? Ten years later Grace is opening the box alone just months after Charlie's tragic death. Struggling to cope with the untimely loss of her best friend, Grace pushes Dan away to the extent that he begins to spend all the hours he can either at football practice, or work, seemingly he'll do anything to avoid his girlfriend. Feeling alone and rejected Grace begins to look for Charlie's Father, a mission that they had both failed in whilst Charlie was alive. Seemingly from nowhere a young woman called Anna presents herself, claiming that she is Charlie's half sister. Anna is a sweet girl, who Grace takes pity upon as she begins to grieve for the half sister she never knew she had. As Anna moves in with Charlie and Dan, odd things start to happen. Grace thinks that she is being paranoid, she thought someone was following her before she even met Anna, and she put that down to a combination of drinking too much with her sleeping tablets, trying to blot out the pain of Charlie's death. But is Anna who she says she is? It not then exactly who is she, and what on earth does she want with Grace? The Sister is a solid debut and I look forward to reading more work from this author. 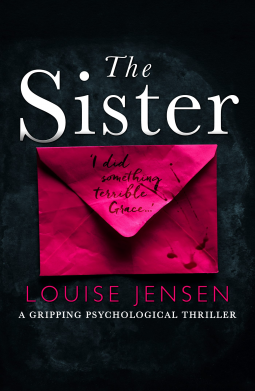 The Sister is available from 7 July 2016.